A couple weeks ago, Slate ran an article suggesting that Bob Hamelin’s 1996 Pinnacle card may be the worst baseball card of all time. As far as major company releases go, it’s hard to argue with that selection. However, I’m more than happy to argue that when you consider regional and team-issued releases, you would be hard to pressed to beat the Dave Wehrmeister’s 1984 Phillies Tastykake team issue card. I suspect we’ll never know the circumstances that led to the creation of this card, but I can’t help but feel that at least a few individuals in the Phillies organization in 1984 really did not like Wehrmeister. I don’t know whether his allergies were bothering him, he had just finished a workout, or he had a drug problem, but the individuals responsible for this card clearly didn’t think he deserved a better picture. 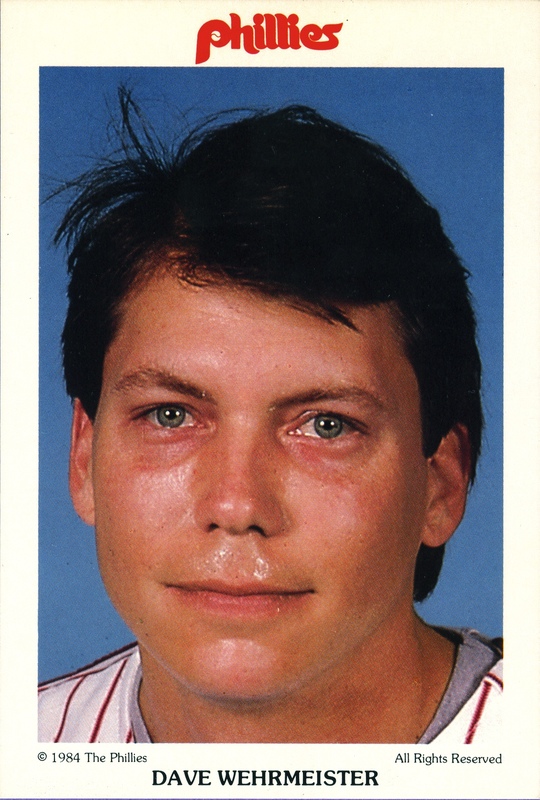 When I sent a scan of it over to Jim at The Phillies Room a few years back, he responded with the question, “They couldn’t have gotten the guy a tissue or something?” What makes this even worse is that this is his only card depicting him a member of the Phillies. So, if you’re a Phillies collector, this is the image you get to remember him by. This entry was posted in Dave Wehrmeister. Bookmark the permalink. I have all the update cards from that set and just rechecked them. Russell is a bit sweaty, but nothing like Wehrmeister. Stone isn’t sweaty; however, his eyes are slightly bloodshot, but again nothing like Wehrmeister. It really is amazing that the photographer couldn’t wait 10-15 minutes for the players to cool down and towel off in order to take some more appealing pictures — especially since these were close-ups. And yet I had to have this card . . . Ugliest card design – 1995 Fleer perhaps? Looking forward to finding out!